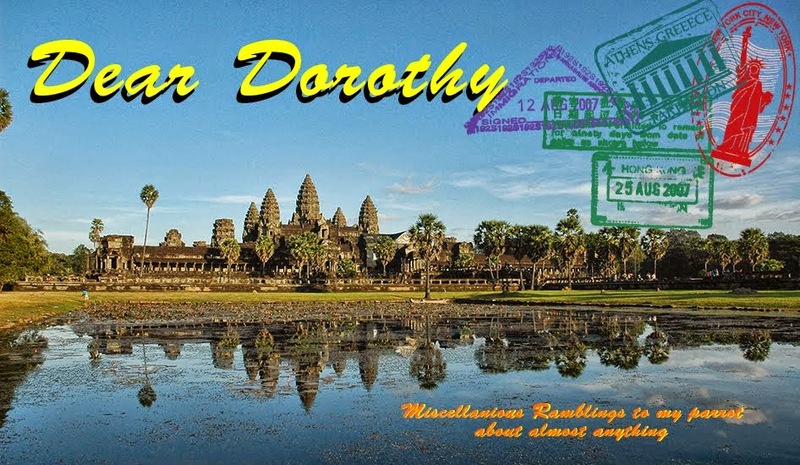 Dear Dorothy: Anchor What ? No, Ankor Wat. Ahhh.. a Phoenix like human rises from the ashes of terminal madness. Bus terminal madness that is. The bus left at the crack of 8 a.m. right on time. Scheduled time enroute 8 hours according the the ticket agent who was sitting next to a big sign that said ten hours. At the ten hour mark we have left Kompong Thom in the dust an hour behind where I had expected Siem Reap to be. Instead it was just a dusty town with a big open air restaurnt and vendors outside. The only thing of interest was that some of the passengers thought it was 'their' bus and made 25 people wait until they decided to return to the bus from their break. I'd have left them but the bus driver was a mensch about it. Oh and the vendors ? They were selling fried crickets and beetles. Maybe if I see them in my next town I'll give one or two a try, but I was in no mood for anything other than getting then F to my destination. Upon arriving in Siem Reap there were the waiting tuk-tuk drivers. I finally got the idea across which hotel I wanted and we got there after a fashion. I went to check in and no room at the inn. 200 rooms and every one occupied. The clerk called another nearby hotel and found me a bed and a shower. I grabbed a cold beer and snarfed down a Club sandwich and flagged a tuk-tuk for the next hotel. The clerk said 100 meters away, but lugging 1 suitcase and one knapsack in the 90/90 heat/humidity was more than I wanted and a couple dollars would save that. It was closer to 1 km away anyway. The room is adaquate. The door locks, the water is hot. The bed is clean and the furnishings keep my stuff off the ground. The view absolutely stinks. A big flat open area that could hold tables and umbrellas, but just holds heat now. The internet - well my computer can sort of see it, but it can't touch it. I tried at 9 pm, 6 am and 1 pm and the story is the same. Maybe next stop will have Wi-Fi that actually works. I went town to breakfast this morn and the large dining hall was filled. People leaning over their plates literally shoveling the food in. Not stopping to swallow before the next mouthful. I don't know if I've ever understood that mentality of 'getting your moneys worth' at a buffet. What really got me was (and this is no lie - I looked) that I was the only westerner in the place. I noticed alot of Asians in the lobby when I checked in, but the only one in a room of a hundred? bus ticket to my next destination tomorrow. Battambang. Where I'll spend 2 nights and return to Siem Reap for my final four nights (I have a hotel reservation here then). Only five hours according to the Lonely Planet. Well one can hope. You stick bikes, scooters, motorbikes, cars, trucks, busses and farm equipment on a narrow 2 lane road call it a national highway and it is slow going. After Angkor Wat it was 10:30 so we putted to Angkor Thom, the largest complex in the Angkor Wat area. It is so big that it too the tuk-tuk five minutes to drive to the first temple after passing the south gate. It was like driving through a Central Park, except there were no buildings above us. Bayon is the temple with 54 (?) towers each with 4 faces carved into it. All of the same king and all different. We didn't get to the Tomb Raider temple with the huge roots encapsulating the temples. That is on my to do list. Back at he hotel around one to chill out and send a postcard to a friend. Then back out at 4 to get some pictures of the western side of Angkor Wat at sunset. The sun and clouds conspired against me again. I got some photos, but some defined shadows would have been great. Then a short rie thorough and around town to look at he sights.The tuk-tuk driver knows where he wants to go and be darned if it's not where I want to go. Eventually he did cave and take me to where I wanted to go. The Victoria hotel. I wanted something other than Khmer food. I like it, but I don't eat the same cuisine every night at home. Escargot (I won't eat a cricket, but I will eat a snail? I kone, I know), a little duck and some fresh sliced tomato with a glass of French wine. Life is good. Tomorrow I get picked up at 7:30 for the 8:30 bus. I'm going to take my knapsack only and leave my larger suitcase. It's just 2 days. I was looking at what to take and what to leave and I am floors by the total amount of superfluous junk I brought along. I'll have to make 2 piles when I get home - This I used - This I didn't. Maybe do better next trip. Sorry I was very tired when I posted this.